This publication celebrates the third anniversary of School of Architecture at the Vienna University of Applied Arts. 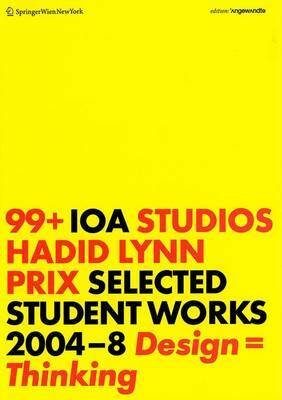 99+ is a collection of selected projects by students in the classes of Zaha Hadid, Greg Lynn and Wolf D. Prix between 2004-08. Along with their design studios, the three star architects Zaha Hadid, Greg Lynn and Wolf D. Prix give students the opportunity of exploring the manifold cross-border possibilities the parameters of architecture offer. The open studio structure makes it possible for students to work on the same subject from their first semester to their degree work, while simultaneously creating dynamics that aren't possible in regular curriculum structures. The Cross-Over Studio is also available to students as well as the three design studios. Peter Sellars, Kivi Sotamaa and Hernan Diaz Alonso have successfully developed new architecture typologies with the students here. The monograph is a collection of exciting projects that are characterized by their innovative design and their professional, appealing presentation. The images serve as inspiration and give us hope for a new, dynamic generation of architects from the heart of Europe.